Romantic. Nostalgic. Beautiful. A place like nowhere. That's Veeranpuzha. Just like lines of a lengthy romantic poem, it strethces in the terrains of your deepest heart. 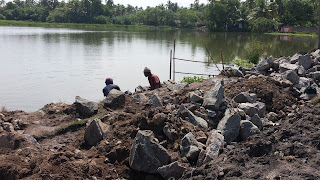 Some days back when I paid a normal visit to the banks of Veeranpuzha, I saw that men are working with the walkway. There were the contracting supervisors also stood there. I asked the details and they said that the local government is planning to exploit the possibilities of Veeranpuzha for promoting tourism. The neighboring people also found very happy. For they know not the dangers and the hidden agenda behind the the word "development". I felt so sad. In 2008 March 10, my first daughter was born. She was named Maria. To celebrate the joyous occasion, many of my friends compelled me to give them a party. Finally, when the busy days passed, I decided to party. Spend a nice evening with them in a place where they all wanted to be. We gathered in the banks of Veeranpuzha again. It was in just the Sunday to Easter. Last week of March. The river remained as same as it was. But the banks were telling a different story. Some changes somewhere. Some culverts were ruined or terminated. 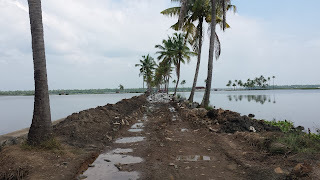 We could not reach in our favorite part of Veeranpuzha due to the culvert was spoiled. Later somebody told us that some big business magnets in the city have bought some land including that spot - our spot. We realized that, we are losing the river. We may lose it forever... The river and her banks may lose its virginity. We celebrated that day anyway. And we returned from there as if it were a farewell party in School or College. May be we would not be able to come back in full freedom as a native. It was a sunny afternoon in June 2006. One of my close friends - Suman Babu - came to my home with his newly bought digital camera. It was a Sony Cybershot R1 series cam. he wanted to shoot some beautiful landscapes with that. We decided to go Veeranpuzha. (Where else..?) Not only to have some test shots, but also to hear the lullabies of wind and waves of our favorite river... and to finish a bottle of Swedish Vodka (I forgot its name)... That was a wonderful day. Nice climate. Beautiful sky. This shot I took on that day with his R1 cam. 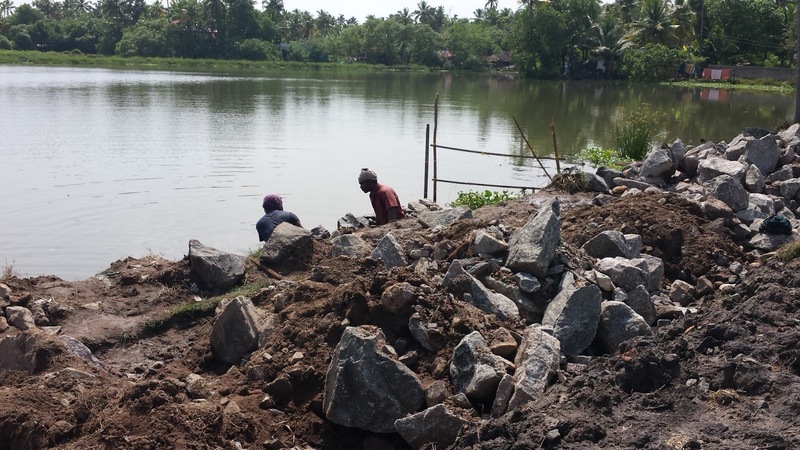 The house-like structure is an inspection hut for fish (prawns) pond (we call it chemmeen kettu). More images here. I was sitting on the banks of Veeranpuzha. With my colleagues at IDENTITI. It was on Friday the 13th of April, 2007. There were three or four bottles of wine and some snacks. There were songs in our heart... It was a Late Easter party. It’s a window opened toward happiness. That’s why I always wanted to share my lovely moments here. When you inspired to dance with the lullabies of paddy fields, you start to realize the truth. Truly you want to share your joy to toast a ‘cheers’ with you. Slowly, very slowly, you fall in love with the nature. 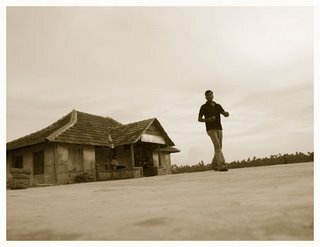 With the fresh air, the wind, the water, the greenish paddy fields, the waves, the sand… your body and soul merge in advaitha state. You feel that the distinction with your body and soul disappears… A real Nirvana. Its Veeranpuzha. The nostalgic place located in my greenest softest part of my heart. So close to my soul, so close to my evergreen dreams. It is the northern extension of Vembanad Lake. From Kochi Azhi to Munambam Azhi, the serene backwaters popularly known in this name – Veeranpuzha. In early 80’s there were regular ferry services from Munambam to Ernakulam. Though it stretches from Ernakulam to Munambam, Veeranpuzha’s Nayarmbalam sector is the most scintillating landscape. You can never forget the sight in your lifetime. The most attracting factor is that it is almost isolated and possibly you can see very few people here. So your privacy is guaranteed. 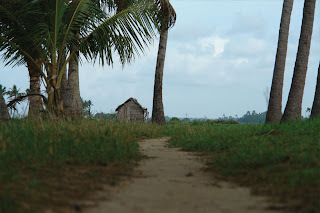 It’s because, this area is covered with paddy fields. Nearest human habitats are a little far away. 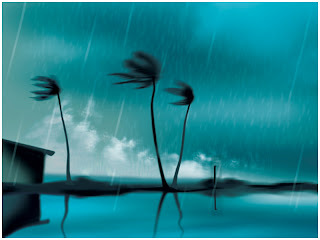 The reason is, the water you will get from here is salty, hardly drinkable. (Vembanad Kayal or Vembanad Koil) is the largest lake in Kerala, India. 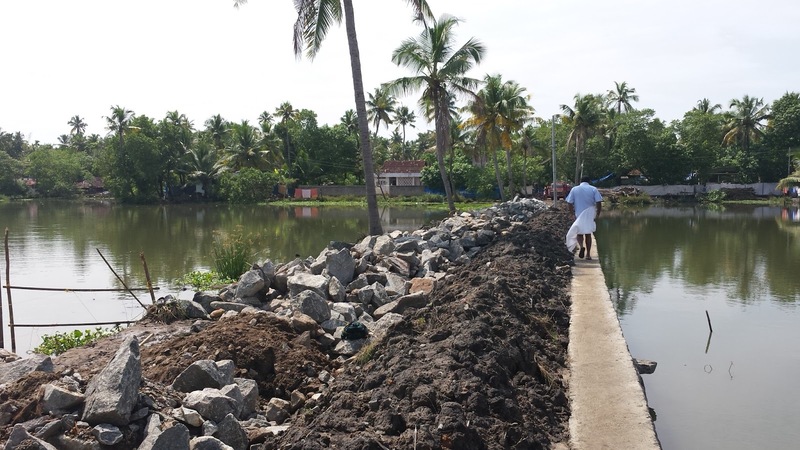 It covers an area of 200 km², and bordered by Alappuzha, Kottayam, and Ernakulam districts. The lake lies at sea level, and is separated from the Arabian Sea by a narrow barrier island. Canals link the lake to coastal lakes to the north and south. Several rivers flow into the lake, including the Achenkovil, Manimala, Meenachil, Muvattupuzha, Pamba and Periyar. The lake surrounds the islands of Pathiramanal, Perumbalam and Pallippuram. The port of Kochi (Cochin) is located at the lake's outlet to the Arabian Sea. 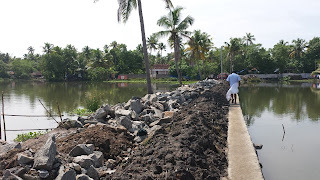 The town of Alapuzha (also known as Allepey), is sometimes called the "Venice of the East" for its large network of canals that meander through the town. The Vallam Kali (the Snake Boat Race) held every year in August is a major attraction. Vembanad Lake is designated a wetland of international importance under the Ramsar Convention. River. Its a form of cyclic life. River is religion. River is civilization. River reminds us several things. River teaches lessons from heaven. River is the prime source of life. Without river we are not what we are now. Just love thy river - which flows nearby thy soul. Feel its wet surface. Touch its cool spirit. Swing in its hot and powerful currents. Veeranpuzha is the river which flows through my soul. Like a mermaid, she lays in the east. Like a friend she calls me to have a chat. She entices. She provokes. Truly Veeranpuzha is a living organism. Veeranpuzha has more life than anyone of us. Let's chat in the banks of Veeranpuzha. Come on. © tom ... Simple theme. Powered by Blogger.